Fiona Woolf, the Lord Mayor of London and City University London Chancellor, joined a Cass alumni event in Dubai last week. The Mayor addressed students, alumni, faculty members, senior members of DIFC and members of the press at the event as The Capital Club Dubai. The Cass Dubai Centre serves as City's only overseas campus, significantly located in the regional business hub in the MENA region. In her speech, the Lord Mayor highlighted some of the Centre's recent successes and achievements. One of these key milestones was awarding H.H. Sheikh Ahmed bin Saeed Al Maktoum, President of the Dubai Civil Aviation Authority, Chairman of Dubai Airports and Chairman and Chief Executive Emirates Airline Group, an honorary doctorate at the Cass Business School Dubai graduation ceremony. Fiona Woolf also cited the latest EMBA intake as further evidence of the Dubai Centre's success as the region's educational hub. This year a diverse cohort of 60 students enrolled on the course. Among them were 18 women and candidates of over 20 different nationalities. Students are flying in for classes from Nigeria, KSA, Qatar, Egypt, Bahrain, Iran, Iraq, Morocco, Pakistan, and India. Between them, these high calibre individuals have an average level of 11 years' experience in the business world. Fiona Woolf said: "I am pleased to be attending this alumni reception in Dubai in my role as Chancellor of City University London and its Cass Business School. The popularity of the City and Cass programmes are a testament to the excellent reputation it has built across the region. We hope the brightest and best people will continue to apply to the programmes at our institution, both in London and Dubai, in order to help maintain its world leading reputation." Ehsan Razavizadeh, Cass Regional Director, MENA, said: "We are delighted to welcome the Lord Mayor of London and Chancellor of City University London Fiona Woolf. We would like to thank her for the continued support she offers our staff, students and alumni. 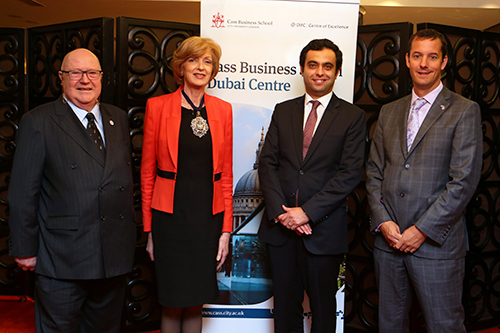 The Lord Mayor's visit to our Dubai campus emphasizes our close ties with both our London colleagues, and also with the City of London - London's hub of business and finance, where Cass Business School's main premises are based. "As Dubai rapidly evolves into one of the world's leading regional trade hubs, it is being recognised for its significant efforts to create a knowledge-based economy built on a culture of education and innovation. In this economic landscape, education and skills-development are key. Through our Executive MBA programme, MSc programmes in Aviation Management and other services, we are pleased to be contributing to the creation of this knowledge-based economy here in the UAE and in the wider region."